Bx21 bus (Morris Park Avenue) to Eastchester Road for Weiler Hospital) and Williamsbridge Road for Montefiore Medical Park. Bx12 bus to Eastchester Road. 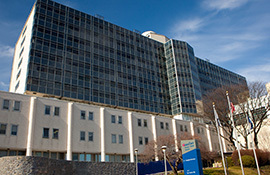 Transfer at Eastchester Road to the Bx31 bus to Weiler Hospital or to Williamsbridge Road for Montefiore Medical Park. #5 train (Lexington Avenue line) to East 180th Street. Pick up Bx21 bus. D train (IND) to Fordham Road (Grand Concourse). Pick up the Bx12 bus and then the Bx31 bus. The MTA Bus Company offers express bus service between Manhattan and the Bronx. The express buses stop at Eastchester Road for Weiler Hospital and Williamsbridge Road for Montefiore Medical Park. Call 718-330-1234 for schedules or check online at mta.info. Hutchinson River Parkway South to Pelham Parkway westbound. Turn left on Eastchester Road. Continue to Weiler Hospital, to Montefiore Medical Park on Eastchester, or turn right onto Blondell Avenue. Bronx River Parkway South to the Cross County Parkway East to Hutchinson River Parkway South to Pelham Parkway westbound. Turn left on Eastchester Road. Continue to Weiler Hospital, to Montefiore Medical Park on Eastchester, or turn right onto Blondell Avenue. FDR Drive to Triboro Bridge to I-278 East/Bruckner Expressway to Sheridan Expressway/I-895 Northbound. Exit at East 177 Street/East Tremont Avenue. Merge onto Devoe Avenue, turn right on East Tremont Avenue, slight left on Silver Street, which becomes Eastchester Road. Continue to Weiler Hospital, to Montefiore Medical Park on Eastchester, or turn right onto Blondell Avenue. Brooklyn Queens Expressway to Triboro Bridge to I-278 East/Bruckner Expressway to Sheridan Expressway/I-895 Northbound. Exit at East 177 Street/East Tremont Avenue. Merge onto Devoe Avenue, turn right on East Tremont Avenue, slight left on Silver Street, which becomes Eastchester Road. Continue to Weiler Hospital, to Montefiore Medical Park on Eastchester, or turn right onto Blondell Avenue. Whitestone Bridge to Hutchinson River Parkway to Pelham Parkway westbound. Turn left at Eastchester Road. Continue to Weiler Hospital, to Montefiore Medical Park on Eastchester, or turn right onto Blondell Avenue. Throgs Neck Bridge to New England Thruway/95 North to Pelham Parkway westbound. Turn left at Eastchester Road. Continue to Weiler Hospital, to Montefiore Medical Park on Eastchester, or turn right onto Blondell Avenue. I-95 North/New Jersey Turnpike to George Washington Bridge upper level to I-95 North/Cross Bronx Expressway to Exit 5A, White Plains Road/Westchester Avenue. Turn left onto White Plains Road, right onto East Tremont Avenue, slight left onto Silver Street, which becomes Eastchester Road. Continue to hospital. Grand Central Parkway East to Whitestone Expressway to Whitestone Bridge to Hutchinson River Parkway, exit at East Tremont Avenue/Westchester Avenue. Turn left on E. Tremont, slight right onto Westchester Square, slight left on E. Tremont, right onto Silver Street, which becomes Eastchester Road. Continue to Weiler Hospital, to Montefiore Medical Park on Eastchester, or turn right onto Blondell Avenue. Van Wyck Expressway to Hutchinson River Parkway North, exit at East Tremont Avenue/Westchester Avenue. Turn left on E. Tremont, slight right onto Westchester Square, slight left on E. Tremont, right onto Silver Street, which becomes Eastchester Road. Continue to Weiler Hospital, to Montefiore Medical Park on Eastchester, or turn right onto Blondell Avenue. There is on-street parking available in the neighborhood around Montefiore Medical Park. Check the street signs for rules and accessibility. Weiler Hospital: 24-hour lot located directly across the street from the hospital on Sackett Avenue; Tel: 718-904-2800. Rates (subject to change): $6 up to midnight; after midnight $12; maximum of $18 for 24 hours. 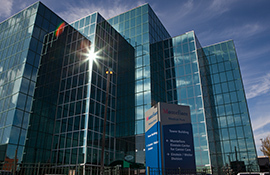 Montefiore Medical Park: Valet parking is available at 1550 Blondell Avenue; also entrance on the corner of Blondell and Eastchester Road. Monday through Friday: 7:00 A.M. to 7:00 P.M.
Rates (subject to change): $5.44 for up to 2 hours; $8.16 for over 2 hours to closing (plus 10% tax).